INDUSTRY.co.id - Jakarta -How ago MUI published MUI Fatwa number 24 year 2017 about Law and Guidance Bermuamalah (social affairs) through social media that one of them contained that every Muslim who bersmuamalah through social media is forbidden to do ghibah (talking about the ugliness or disgrace of others), slander , Namimah (shear), and the spread of hostilities. The MUI also prohibits harassment, hate speech, and hostility based on ethnicity, religion, race, or intergroup. "We invite other institutions to cooperate to negate the negative content that led to the unrest of the society," said Chairman of MUI (Majelis Ulama Indonesia) KH Masduki Baidlowi at a seminar held by Indonesia Technology Forum (ITF) in Jakarta, Monday (28/8 / 2017). The Seminar of Indonesia Technology Forum (ITF) discussed the theme of 'Charging the Real Step of Telecommunication Industry and OTT Facing the Negative Impact of Social Media' by presenting the Chairman of Indonesian Ulema Council (MUI) KH Masduki Baidlowi, Commissioner of BRTI (Indonesian Telecommunication Regulatory Body) Agung Harsoyo, Group Head Corporate CommunicationIndosat Ooreoodo Tbk Deva Rachman, and Public Policy Lead Twitter Indonesia, Agung Yudha. "BRTI encourages the synergy of all parties and institutions in tackling negative social media content. The post must be realized if it has become immortality. So if struck by others it is obviously easy, "said Agung Harsoyo, Commissioner of BRTI (Indonesian Telecommunication Regulatory Body) as well as lecturer at STEI Institut Teknologi Bandung. "Telecommunications subscriber registration rules will be fixed and IPv6 enforced as a digital identity and facilitate tracking of negative internet users," Agung added. "We are committed to reducing and preventing negative social media content. We have content filtering system, so negative content is not outstanding. Globally we have blocked a million accounts related to terrorism and violence," said Agung Yudha, Public Policy Lead Twitter Indonesia. Agung added that app users should also read the rules and terms of services before using the service. "There are rules about conservation when the post has become public consumption," he said. Social media is like a double-edged sword because it can be useful for many users but can also be used to spread negative things. 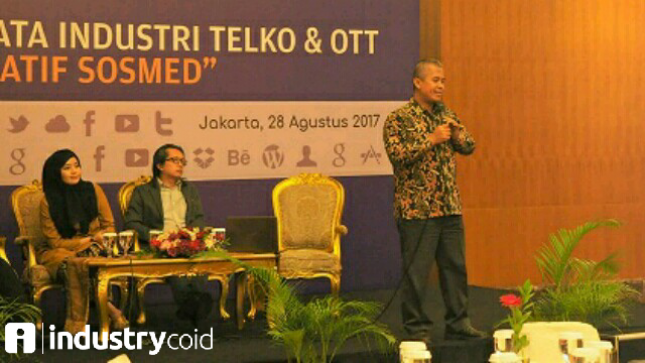 "We have to be a more critical, wise, and always cross check the information we receive," said Deva Rachman, Group Head of Corporate Communications Indosat Ooredoo Tbk. Therefore it also participated to educate the public with the campaign #Bijaksosmed involving young people who are now an active target of social media. As an institution, the ITF encourages the full contribution of the telecommunication industry and the OTT actors to initiate and dissect ethical and socially wiser social culture in the context of Indonesia, so that there is a new order in the implementation of social ethics that is culturally appropriate for Indonesia. There needs to be an agreement on ethics with social media because for umbrella law and fatwa is available. Social media social media ethics socialization must be a massive national movement and always reminded to social media users in the country.